Further Update: Faststamps take flight at Stampex, in September! 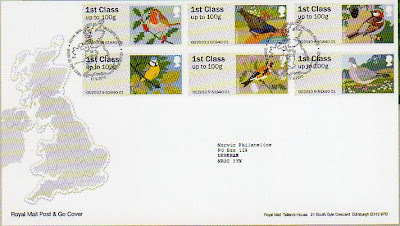 Royal Mail have confirmed that the set of 6 1st class Bird Faststamps supplied to Bureau customers will be a 'sheetlet', ie they will be on one undivided sheet of backing paper (see above) in two rows of three stamps, the same format as the official first day cover. The sheetlet will consist of 6 x 1st class stamps as shown, whereas the machines will dispense 5 different values. It will be interesting to see how these are catalogued! This is in contrast to the original Machin head Faststamps pack issued from the Bureau in March 2009, months after the launch at Bristol (October 2008). Originally Royal Mail had said that the Faststamp* was a Post Office product and not a philatelic product, so would not be issued from the Bureau. 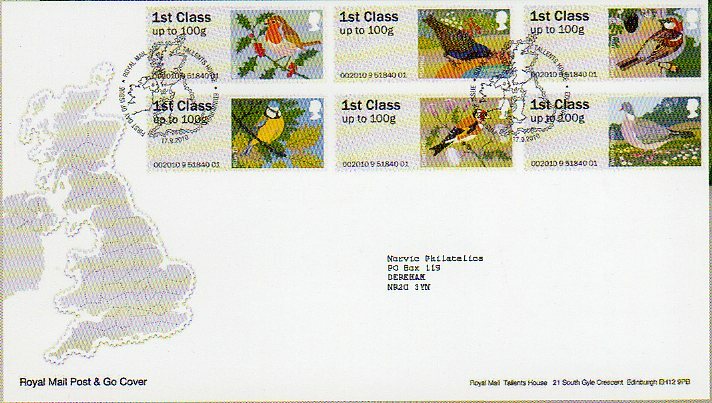 When it was pointed out to them that the original Frama labels issued in 1984 (right) were the subject of special distribution from the Bureau, with a specially designed FDC and FD postmarks at each of the trial sites, Royal Mail had a rethink, hence the appearance of the Machin Faststamps pack. 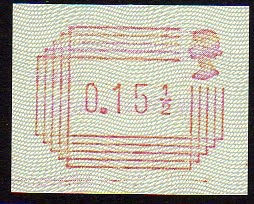 With the original Faststamps there were differences in the printing method of the machine stamps versus the Royal Mail issued set (i.e. inkjet printing of the text versus gravure). Do you know if the same differences will apply with this issue ? I believe that the same will apply. As there is not even the pretence that the sheet version comes from the P&G machine, they will be printed by Walsall by gravure, with two phosphor bands. Let's hope Walsall manage to get the bands in synch this time. On the previous ones the stamps WITHOUT bands short at top or short at foot were the scarce ones, with the packs having a mix of types!